Since so much of the previous EP was concerned with a doomy riff, it comes as a rather pleasant surprise that this full length opens with something more atmospheric. Far more atmospheric. Stretching out to almost seven minutes, ‘Transmission’ is a sprawling instrumental piece that’s dark and ominous, but not necessarily heavy in the traditional sense. A world of melodic lead bass paves the way for everything that follows: a measured beat, a floating drone via the guitars and an all round sense of the other worldly, each aspect adding up to a great listen. More Hawkwind than Kyuss or Allfather, the space rock vibes are accentuated further by disconnected keyboard sounds that evoke an all round airiness. The bass that kick started everything, meanwhile, drops back in order for everything else to have time in the spotlight, before returning to its original riff to wrap things up. For those who’ve never heard the band before, this more than sets up feelings of something epic about to unfold. 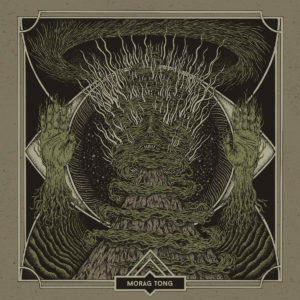 The expected intensely heavy side of the band drives parts of the second number ‘New Growth’, very much establishing more of Tong’s doom stance over the space rock, but there’s so much more of a sense of a band reaching into new territory, especially since the sledgehammer riffs are balanced by various progressive nods. Again, the bass is prominent, throwing out heavyweight thuds in a few places while returning to a complex lead style in others, while a dual guitar sound chugs with an oppressively slow mood. With the push and pull between the incredibly heavy and progressive space rock noodlings, the band really hit their stride here, but as with the EP, a gravelly and echoing vocal – half buried under the riffs – has the potential to divide opinion. Looking at the whole picture, though, this is the work of a band whom understand there’s power in a riff…and know that, for many listeners, that riff will be all that’s needed to win. Retaining the slowness but dropping back on some of the heaviest elements, ‘We Answer’ provides one of the album’s most essential cuts. Taking a Pink Floyd sense of pacing and space and combining that with the kind of space rock jams practised by Wax Fang, this number has a relative simplicity but never becomes dull. Almost hypnotic in its use of distorted howling guitars and the way they rarely deviate from their original riff during the first five minutes, this manages to weave some of the ideas from the opening number into more of a song based format, whilst still showing off some incredible musical skills. For the track’s second half, Tong drop into a sludge pit of riffs – cranking things at their slowest and most obtuse – before slowing down further still. With this dictated by a very simple pounded drum, it’s one of the moments where the riff is everything…and if you aren’t keen on sludge there’s nothing for you here. By the time everything gives way to a world of fuzz and feedback, you could be forgiven for thinking that something that began as hugely impressive space rock had now had its guts ripped out and turned into a Melvins-esque art project, but the drones soon act as a simple device to segue into the next piece, ‘To Soil’, a drearily slow, far more purist excursion into sludge metal sounds. One of those extreme metal numbers that seems like it’s been played back on vinyl at the wrong speed, if nothing else, it gives guitarists Alex and Louis almost nine minutes in which to flex some serious muscle. Underneath everything, drumming vocalist Adam sounds like he’s retching his guts out whilst beating slowly at his kit – a dual performance that sounds like he’s working overtime to keep such a slow and steady (non) groove throughout. Those who crave maximum sludge will love this, but in terms of the bigger picture, it isn’t necessarily the album’s most interesting track. The double whammy of ‘Ruminations’ and ‘Ephemera/Stare Through The Deep’ ends the album with a hugely sprawling world of metal, post rock, sludge and heavy prog vibes. Seguing into each other, they’re best heard together, especially since ‘Ruminations’ offers a few minutes’ worth of impeccable drone rock where a deep soaring guitar is underscored by a very measured drum and extra guitars that sound like the musical equivalent of a man sawing through wood. ‘Ephemera’, meanwhile, switches the mood entirely, bringing with it clean guitar noodles and a mumbled spoken vocal, much closer to the likes of ‘Set The Controls For The Heart of the Sun’ and ‘Careful With That Axe, Eugene’ than any metal classic you’d care to name, doom or otherwise. The way Adam weaves a flat sounding, old fashioned drum style into a warm bass is just terrific – so much so, that its a shame when ‘Stare Through The Deep’ inevitably crushes everything that’s gone before with a sludgy riff that sounds like an unholy hybrid of Crowbar, Pineal and more besides. The bulk of what follows is straight doom fare, but there’s no denying these guys play such a style very well and here, especially, the density and volume of a live performance is almost captured in the studio for posterity. There’s so much distortion in places, it mightn’t be wise to try listening through inferior equipment or earbuds. In order to close with something a bit more cerebral, though, it’s great to hear a semi-bluesy lead guitar rise out of the swamp and in doing so, that, combined with a world of Hawkwind-ish mind-bending distortion, ensures Morag Tong bow out on a high. ‘Last Knell of Om’ is hard going in places – it’s almost certainly an album that many will struggle to get through in a single sitting – but it’s a superb snapshot of a band showing off some great arty qualities that deserve to set them apart from other potentially similar acts. If you’re approaching this from a purists’ doom/sludge perspective, at least half of it might confound you, but if you want to experience maximum heaviness contrasted with some truly fantastic, almost neo-psych head trips and more, step this way… If you’re willing to keep an open mind, there’s so much here to absorb…and eventually love. This entry was posted in Album & EP Reviews and tagged doom, metal, morag tong, sludge metal, space rock, stoner by Real Gone. Bookmark the permalink.